Fayzinsso Vohidova. Screenshot sourced from CATV News YouTube Channel . 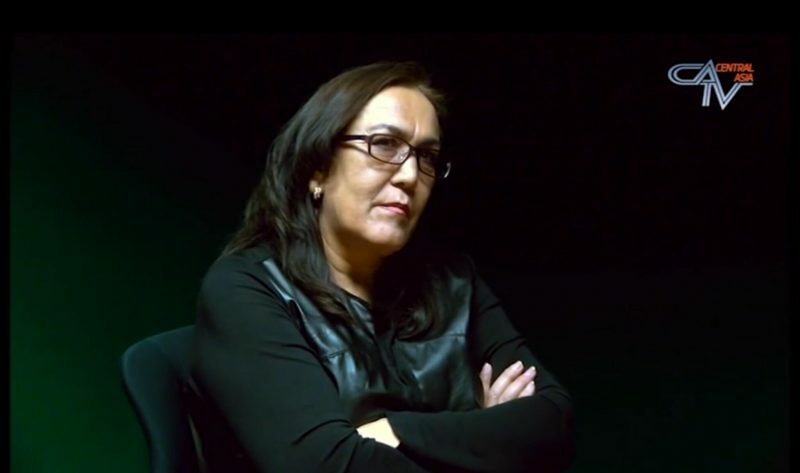 Fayzinisso Vohidova, a prominent Tajik lawyer who was renowned for her preparedness to defend political arrestees and constant criticism of Tajikistan's authoritarian system, passed away on January 4. A mother of three, Vohidova was often referred to by her admirers as a “Gurdofarid”, referencing the fearless ancient Persian heroine from the Shahnameh epic Persian poem . Although she avoided arrest, Vohidova had her license to practise law suspended and could not leave the country  at the time of her death. Steve Swerdlow of the Human Rights Watch group wrote a moving and widely-shared thread on Twitter in honour of a woman he regarded as a friend and colleague. Vohidova was born in a remote district in northern Tajikistan and studied law at the prestigious Moscow State University. A member of the opposition Social Democratic Party of Tajikistan, she earned a name defending young people facing jail over extremism charges widely applied by the secular authorities. When a BBC reporter, Urinboy Usmonov, was arrested  on similar charges in 2011, it was only logical that Vohidova would take up the case. Usmonov was convicted but freed from jail as the international media spotlight burned down on the country. Tajik Facebook has never been in mourning the way it is now. Even by leaving us she gave us a lesson. “She was not silent when others buried their heads in the sand. She risked her life every day and knew the value of this risk,” added Sarkorova. Vohidova’s own Facebook wall, filled with birthday congratulations just two weeks ago, is now overflowing with condolences. Tajik social media users who have been silenced in recent years thanks to state targeting of online critics, broke this silence to express deep sorrow at Vohidova's passing and their own rightlessness. In a country passionate about poetry, it is perhaps unsurprising that some users expressed their distress in verse. A wing of the bird of freedom and justice broke! The mother of braveness died! I have never felt so lonely in recent years as now, though I have never met her (Fayzinisso) and talked to her. Rest in peace, Fayzinisso! On December 9, in her last ever Facebook post , Vohidova wrote about two women that she particularly admired — German Chancellor Angela Merkel and the well-known Russian rights defender Lyudmila Alexeyeva, who had died the day before. “In any case, there is only one path (to God)! And this path should be the path of honour, of good will and actions, with human dignity, pure and modest. Let us pray to God to ask that people would cry after each one of us with tears of thankfulness!” Vohidova wrote. Editor's note: Global Voices included a short profile of Fayzinisso Vohidova in the 2016 post Six Tajik mothers who rule the roost on Facebook .